The iPad is one of the largest selling tablet computers on the planet and it’s all thanks to great hardware and complimenting software. However, the key to the iPad’s success also happens to be one of its biggest weaknesses. The now high resolution display despite using the latest glass and protection technologies does crack and break. It’s now ultra-light weight and skinny bezel often makes people forget that they are holding something in their hands which is the leading reason for cracked screens which merits an iPad screen replacement. When faced with the prospect of a replacement you can either do it yourself or you’ll need to send your iPad to a professional for repairs. If you decide to do it yourself the five tips below should help make the process easier. Before you even think of attempting an iPad screen replacement procedure you should find and purchase the right iPad screen kit for your device. Even though all the generations of the iPad look the same the kit varies and is tailored to each specific generation. So if you’re using the iPad 3 then buy a kit that is meant for the iPad 3 and don’t use the one (if you already have) for the iPad 2 or the first generation. This will make things a lot easier for you and there is a lower chance of you damaging anything. When your screen kit arrives make sure that it has everything included before you start taking apart your iPad because this is one procedure you don’t want to leave hanging until a missing component arrives. If you’ve followed through with the tip above and bought your kit then you’ll also know that there are two types of kits, the more expensive ones come with the screen while the cheaper ones do not. If your kit didn’t come with a replacement iPad screen then you’ll want to buy one separately. There are two types of replacement screens you can buy online one comes with adhesive pre-installed while the other does not. Ideally, you’ll want to buy the one which has adhesive pre-installed as it makes installing the screen easier. You’ll also obviously want to buy a screen that is for your specific iPad model because any other screen may not work. Before you take apart your iPad to replace the screen you need to understand how the iPad has been built. All generations of the iPad generally consist of three layers. The first is the glass layer, which is pretty obviously the smooth texture that you feel when you move your finger across the screen. The second is the LCD which is directly below the glass layer. 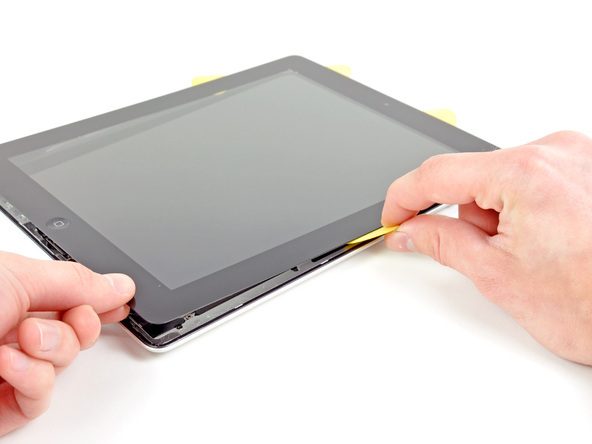 The third layer is beneath the screen and consists of the motherboard and bezel or the frame of your iPad. When taking apart your device keep these three layers in mind to so that you have things in perspective when both taking your device apart and when putting things back together again. Unlike taking apart your laptop with your iPad you’ll have to make sure to remove or loosen the adhesive in order to first remove the top glass and then the screen. This can be tricky but using a hairdryer can make it easier. Simply run the hairdryer along the sides of the screen until it feels hot, then insert the pry tool from your kit in between the layers and slowly move either side. If it feels stuck, then use the hairdryer again to loosen the adhesive. Removing the glass screen takes time and patience but if you rush through you stand the chance of damaging the screen. Any iPad screen replacement expert will tell you that the screen is a finger print magnet. The screen can attract lots of finger prints and you obviously do not want to later find out once you’ve put everything back together that there are fingerprints on the other side. So, in order to avoid this http://www.brisbaneiphonescreens.com.au recommends that people wear latex gloves. Mark has been repairing iPads since the first generation. His services include iPad screen replacement and he is a certified repair person with decades of electronics experience behind him. He also specializes in repairing laptops, iPhones, iPods and MacBooks. He currently offers his repair services in Brisbane.